The J/34 was originally conceived and designed to compete under the IOR handicap rule that was popular in the 1970's and 1980's. This model fit into the "3/4 Ton" class of the day and was actively raced at IOR events up until the demise of the rule in the late 80's. 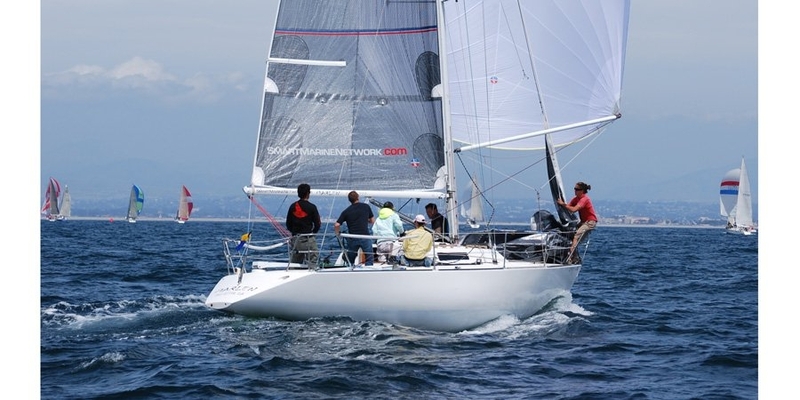 Since then the J/34 has enjoyed success racing under the PHRF handicap system with an average rating of approximately 114. Several owners have also converted their J34s for cruising. While the design concept of the J/34 is similar to J/Boats other successful IOR design (the J/41) with low freeboard, wide decks for effective hiking, a high aspect masthead rig, low wetted surface, long effective sailing length for the rating, the shape is not precisely a scaled down version. The stern is a bit wider for more power and the keel is closer in concept to the J/29 and J/35 with a low VCG for good stability and a more forgiving shape to reduce the incidence of stalling. Interior- The layout of the interior is functional with a V-berth, walk-thru head forward, proper settee berths in the main salon aft of a centralized galley. The 18hp Volvo engine is located just under the companionway ladder with quarterberths to both port and starboard. Pipe berths were offered above each of the main settee berths and quarter berths to accommodate crew for offshore distance races. Rig- The J/34 has a double in-line spreader masthead aluminum rig with a high aspect mainsail and overlapping headsails. Running rigging is Navtec rod with open body Navtec turnbuckles. The spar package was built by Hall Spars of Bristol, RI.